Most of the time my Print of the Month will be a colorful landscape or unusual geologic formation or some such. This month will be different. Many people have an innate fear of snakes, often from tales told or experiences had in childhood. Growing up in South Louisiana, an area with snakes in abundance, I learned early on to respect but not fear snakes. In those days as a teenager, though some of you may find what I am about to tell you hard to believe, I caught snakes of all varieties, including poisonous cottonmouth moccasins, regularly. When I stumbled upon this fellow on the edge of a mixed deciduous woods in north central Alabama, I just had to get his (or her) picture. 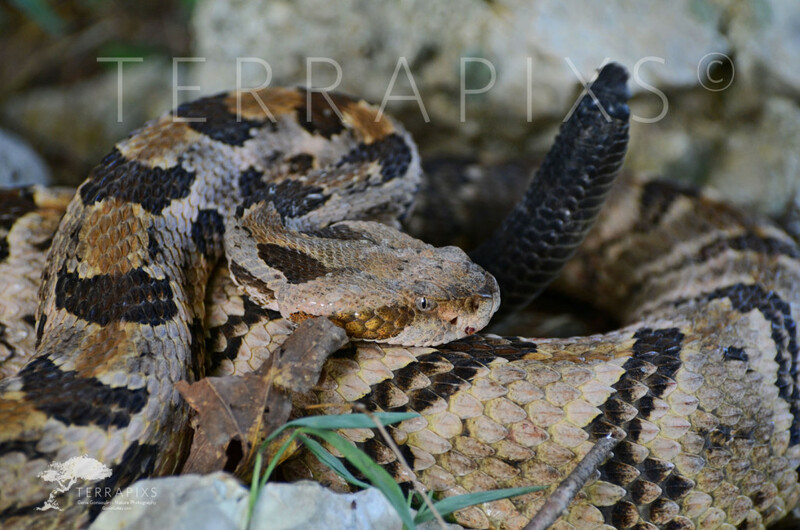 He is Crotalus horridus, the Timber rattlesnake, sometimes called the Canebrake rattlesnake though that guy is generally classed as a subspecies. Though fearsome looking, rattlesnakes are highly beneficial in controlling rodent populations and should not be indiscriminately killed. He is just part of the scenery. They say beauty is in the eye of the beholder. For me, he is a handsome, beautiful (albeit venomous) creature, though I suspect I am in the minority on that point. In Alabama, and particularly on our farm with ample rock outcrops for them to hide, we have many Timber rattlers as well as Copperheads, both in the “Pit Viper” family, named for the pit-like heat sensing organs located on each side of the head with which they locate their warm-blooded prey. They also have a keen sense of smell and are stealthy hunters. I have seen Timber rattlers on the order of 3-5 feet long, some a bit longer. As you can see, they are fairly heavy bodied snakes with distinctive markings and patterns and are superbly camouflaged on any leafy/rocky surface. This fellow has 10-12 “buttons”, or rattles. They shed their skin, as do all snakes, every year or two as growth occurs, at which time rattlers add another “button”. So, despite the fact that rattles often break off, the number of rattles generally tells the snakes age. This snake reached sexual maturity 5-6 years ago. Females give birth to up to 15 young every three to five years. Most people do not realize that many rattlesnakes can have a life span of 15-30 or more years. The Timber rattlers range extends from the upper northeast to the Gulf coast out to Texas. Populations are diminished in the northeast and healthy towards the south and western ends of their range. Respect them and give them their distance, if you actually see them that is. And, if you don’t see them, take solace in the fact that they are trying their best to avoid contact with you. If you feel that you cannot live without this beauty adorning a wall in your house as a great conversation piece, he is for sale!